The Iranian government's official news agency (IRNA) has confirmed reports that police in a working-class neighborhood of Tehran fired shots in the air Friday February 15 evening after residents had a clash with morality enforcement agents. Iran has special morality police, which patrols the streets, especially to enforce hijab rules for women. Some agents of this special police stopped two young women for violating hijab rules. The women protested and onlookers began defending them. Police then took the women to their patrol van. 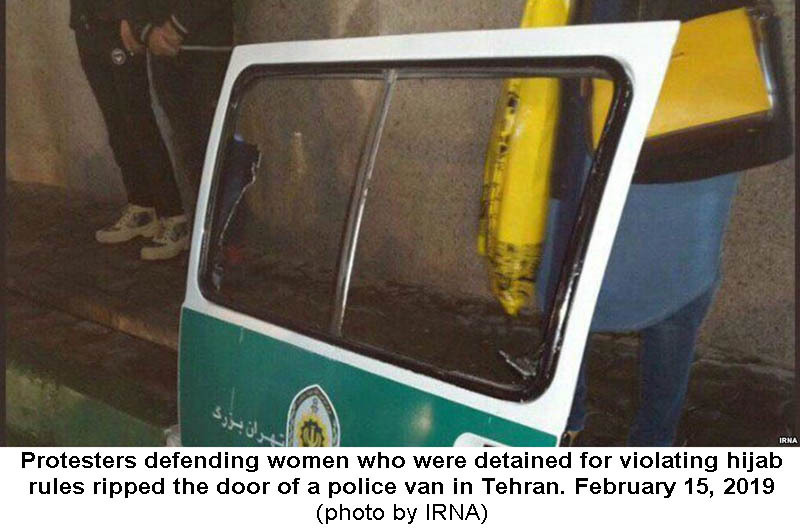 Passersby intervened and ripped one of the vehicle's doors to free the women. At that point police resorted to firing in the air to deter the crowd. IRNA says the police "were forced" to fire shots in the air. Eventually, as protests continued, the morality police had to let the two women go free. Citizens have published many videos in the past showing passersby intervening to push back against the morality police or clergymen who stop women to chastise them for their head-cover or attire.